Rather than posting links or screenshots from all forums and comment sections I decided to compile and reflect on my findings. The majority of comments online are positively written and are meant to aid parents and professionals in working with children exhibiting opposition and defiance. The majority agree that time, modelling appropriate behaviours, and clear consequences are all strong strategies to aid a child with ODD. Many agree that ODD is often coupled with, or overshadowed by, other diagnoses such as ADHD or anxiety disorders. Most information is observation or opinion based and not backed on research or professional merits. Lack of peer-reviewed information makes these online conversations challenging, but also shows how new and evolving the information is. Where the online community does not agree with each other is in the classification of ODD. Many see it as a strong neurological disorder, others a behaviour class based on trauma or stress, while others think it is completely made to explain behaviours from other diagnoses or events. 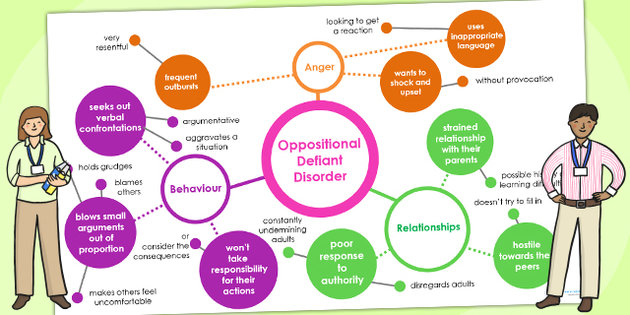 This debate often caused people to forget why they were commenting in the first place – to spread information and support those working with defiant children. Many parents believed their children should be diagnosed with ODD based on little to no information. This is a dangerous belief to hold as a parent, because you can begin labeling your child with issues they are not facing – just because my child fights bedtime doesn’t mean I need to diagnose him immediately. This definition is taken from the mayoclinic website. The wording, much like the majority of resources I have found so far, is parent focused as opposed to educator focused.